Much has changed since 1995, the year The Beer Column first appeared in these pages. Early articles devoted attention to the ingredients, the brewing process, to beer styles, and the process of tasting and evaluating. Craft beer today is bigger and better than ever, and along with growing waves of new products, change has brought a new type of beer customer into your store, your bar: a consumer with knowledge. May’s column was about today’s beer enthusiasts, who have a deep and abiding love of beer and are wired in to trends and new releases. Some of these people are in their 20s. This type of consumer is driving the expansion of beer menus on-premise and beer sections in the package store. But it’s one thing to offer a beer; it’s quite a different accomplishment to sell that beer, along with the hundreds or thousands of others that are and will become available. Retailers large and small say that they want and need more education about U.S. craft beer. Import sales are flat at best, the American commodity beers are down, but craft is growing. Knowing more about the the brewers, the styles, the ingredients, and the industry will help with ordering, with display, with expansion. It will help to attract more craft beer customers, who pay more to sustain their delights. Done right, it will engender customer loyalty. It seems, then, that we have come back to a beginning, to a discussion about good beer and everything that comes with it and from it, a discussion that will occupy this space for some time, a discussion driven by profit but overflowing with benefits. 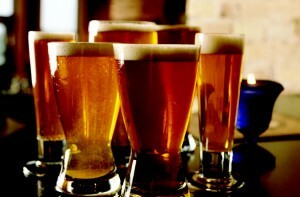 The first thing to do is to equip yourselves with knowledge of beer styles. This task is the longest and hardest of all, but there’s no final exam. And it involves tasting beer, which is not disagreeable. Taste the beer. Choose a style from the guidelines, gather some friends or your employees and pick a half-dozen or so beers in that style. (Remember, if you’re tasting in an off-premise establishment, Connecticut law limits the number of open containers to four.) Notice in the guidelines the words Aroma, Appearance, Flavor, and Mouthfeel. Same as tasting wine. Beer is made from water, barley, hops, and yeast. There are two types of beer: lager and ale. The difference is in the yeast. Lager yeast ferments at cooler temperatures and settles to the bottom of the kettle. Ale yeast needs warmer temperatures to do its work, and does so at the top of the kettle. Because of cooler fermentation, lager yeast does not contribute much to the flavor profile of the beer. Ale yeast, however, provides a great deal to the flavor. Beer is at least 90 percent water. The chemistry of the water plays a major role in beer flavor because it reacts with the other ingredients. Brewers today understand water chemistry and can alter it to duplicate any beer style with accuracy and consistency. Barley makes the best beer because of its flavor and its abundance of starches. The barley grains are dampened so that they begin to sprout. At that point it becomes barley malt. The malting process converts the grain’s large starch molecules into smaller sugar molecules, which are necessary for fermentation. The malt is dried and ground and put into a kettle with water for the boil. Hops are added to the boil early on for bittering, and usually at the end of the boil to contribute aromatic aspects to the beer. Hops are the female flowers (also called cones) of a plant in the nettle family, a relative of marijuana. The cones contain resins and oils which, in addition to flavoring the beer, work against undesirable micro-organisms (but not yeast). After the boil, the liquid is cooled and yeast is introduced. Remember those sugars in the barley malt? That’s what yeast eats. Out the other end come alcohol and carbon dioxide, both important ingredients. Ale yeast produces a wealth of esters – flavor components – to beer. These are prominent in some beer styles, particularly hefeweizen, the German wheat beer style. When the yeast concludes its fermentation, the beer is filtered and put into maturation vessels for a time determined by the beer style and the brewer’s inclination. Lager matures for a longer time than ale (in German, lager means “to store”), up to six weeks or longer. After that, you have beer. Jack Kenny has been writing The Beer Column for the Connecticut Beverage Journal since 1995. Write to him at thebeercolumn@gmail.com.